Moderator Bradley Whitford, James Corden, Rob Crabbe, and Ben Winston speak at PaleyFest in Los Angeles on March 22. 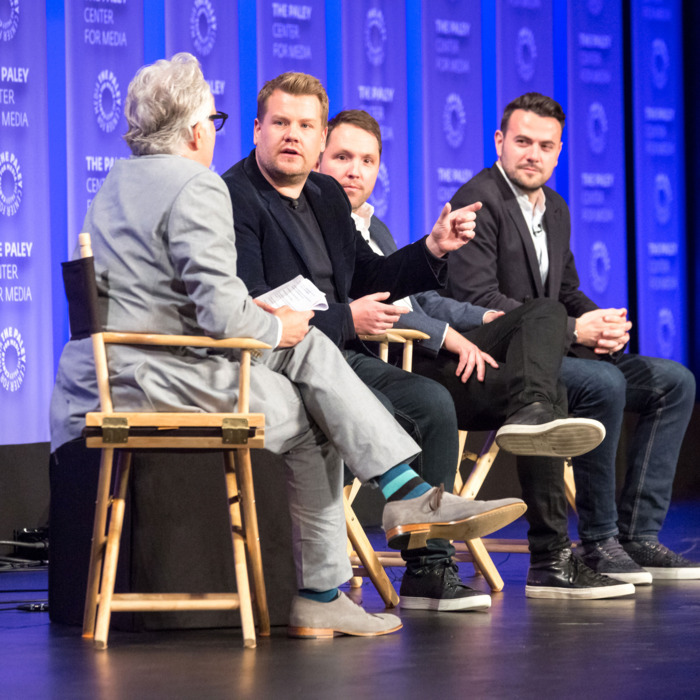 On the night of the Late Late Show’s second anniversary, host James Corden and executive producers Ben Winston and Rob Crabbe visited PaleyFest in Los Angeles. After a conversation about how the show found its unique form and developed massively popular viral bits like Carpool Karaoke, Corden was lobbed a more hardball question during the audience Q&A: Would he ever have Donald Trump on the show? “We’re not a political show, but you know where we stand. We talk about Trump every night,” he began. “When he announced the travel ban, we did a video about that.” While Corden said he didn’t think the criticism against Jimmy Fallon’s handling of Trump was “fair,” he added, “I don’t think anybody took Trump to task or asked him the questions that needed to be asked.” So what would Corden do differently, then, if he had the chance to sit down with President Trump? He already has a bit in mind that he’s calling “Stand By or Take It Back.” “I’d read stuff he said on the campaign trail,” Corden explained, “and he’d have to say whether he’d stand by the statement or take it back.” Now that’s a bit we’d love to see.